You are here: Home › ALL BLOGS › Imo Governorship and the Arithmetic of Ihedioha’s victory. Imo Governorship and the Arithmetic of Ihedioha’s victory. Come March 2,2019,Nigerians will go to the poll again to elect their preferred candidates to man the seat of governance in the 36 States of the federation. While political analysts can hazard a guess as to the outcome in some States because of the performance of the incumbent governors and their political parties, the story may be hazy in some other States for various contending factors. In Imo State, the situation is a kind of battle of generals who were once under one platoon as a command channel. As it is now, things have fallen apart and these generals are now commanders of their individual platoons. No doubt, this scenario makes the 2019 Imo governorship an interesting centre of attraction as to what the outcome may likely be. At this stage, I do not intend to mention the names of these political generals and their parties to avoid a misconception of my intentions (but I will certainly do in the course of this piece), suffice it to point out that “though all animals are equal but some are more equal than others “as George Orwell averred in his book “The Animal Farm.” In terms of capacity, acceptability, grassroots structure/ mobilization and robust campaign strategy, one can unequivocally argue that Rt Hon Emeka Ihedioha of the Peoples Democratic Party (PDP) is leading the other candidates. Ihedioha and PDP are on the lips of every Imolite you come across and have also become point of positive discussion and reference points in most rural communities of the state. Like the mobile network service provider, MTN, Ihedioha and PDP are everywhere you go in Imo State. Unarguably, Ihedioha has doggedness, focus, panache, sincerity and capacity with a well articulated blue print for recovering,rebuilding and liberating the already battered Imo. Indeed, the quantum of dilapidation in all facets of the state is intimidatingly humongous that it needs an internationally acclaimed political leader and seasoned administrator of Ihedioha’s pedigree to squarely address without much ado. Borrowing from the medical parlance, Ihedioha is like a consultant physician with dynamic knowledge of general medicine practice, so fixing Imo won’t be a herculean task for him unlike most of these other people aspiring to govern the State purely for pecuniary interests. On the arithmetic of winning the election, every political analyst would agree with me without sentiment, that the battle is between Ihedioha and others. The analytical indices buttress my assertion here. Lets appraise the situation as it is. In Orlu zone, Distinguished Senator Hope Uzodinma will be on war path with the incumbent governor, Owelle Rochas Okorocha also of All Progressives Congress (APC). Okorocha will be backed by his son in -law and governorship candidate of Action Alliance (AA),Ugwumba Uche Nwosu also from Orlu zone. As most people believe, Senator Uzodinma will most likely work for Okorocha’s defeat during the senatorial election on February 16,2019 in order to whittle the governor’s influence on his own election two weeks later.But if Uzodinma succeeds, trust me, the Okorocha we know will charge ferociously to draw his own pound of flesh. Besides, the outgoing governor knows that Orlu is his catchment area and will do anything to surmount opposition there. Ditto for Senator Uzodinma. Ihedioha in turn, equally enjoys large followership in Orlu zone. His deputy,am amiable and jolly good fellow, Engr Gerald Irona is from the zone. All PDP federal legislators from the zone except that of Ideato North and South federal constituency are of PDP. The same goes for the former governor, Chief Achike Udenwa (Onwa), who is well loved by the people of the zone. In fact, major political heavy weights from the zone who believe in equity are solidly behind Ihedioha. The above cannot be said of other candidates whose presence in the zone is infinitesimal. It is therefore, clear that the votes in Orlu would be split mainly amongst Ihedioha, Uzodinma and Nwosu. Even if Ihedioha gets 30 percent of the votes cast there, fine and okay. In Okigwe zone, the old rivalry between former governor Ikedi Ohakim of Accord Party and Senator Ifeanyi Araraume of All Progressives Grand Alliance (APGA) will be rekindled. Obviously, these two will fight to finish as their political relationship has ever remained like that of cat and dog despite the deceptive smiles put up by the duo whenever they meet in public fora. Again, Ihedioha has a very strong presence in Okigwe zone. His good works for the zone when he was Deputy Speaker of House of Representatives still rings bell in the minds of Okigwe zone people. Though with six local government areas, it is believed that Ihedioha will win in Obowo, Ihitte Uboma and Ehime Mbano. He is equally expected to garner appreciable votes in Okigwe, Onuimo and Isiala Mbano LGAs. Ohakim and Araraume incontestably, remain the two dominant factors in Okigwe zone. The political acrimony between the two lords is expected to be in Ihedioha’s advantage. The two are like parralell lines which can never meet. Besides, Ohakim could not have forgotten in a hurry, the political back stabbings he has continually suffered in the hands of his brother, Araraume. Only Ohakim can best tell the story and pains he has passed through in the hands of his fellow kinsman, Senator Araraume. From records obtained from the Independent National Electoral Commission (INEC), Owerri zone has the highest number of registered voters in Imo State. With nine local government areas next to Orlu’s twelve, Owerri zone is Ihedioha’s solid base. In terms of clamour for equity in rotation of the governorship of the state, the zone enjoys massive sympathy from other zones. Besides, the people of Owerri zone have unanimously endorsed Ihedioha as the zone’s sole candidate for the governorship. Other candidates from the zone in other parties have been requested to drop their ambition and team up with Ihedioha in the interest of the zone. This being the case, and with the avowed resolve of the people of the zone to vote massively for Ihedioha ,it is believed that the PDP candidate will scoop up to 80 percent of the votes to be cast in Owerri zone. If this is added to the votes he garners from Orlu and Okigwe zones, nothing stops Ihedioha from being declared the next governor of Imo State. 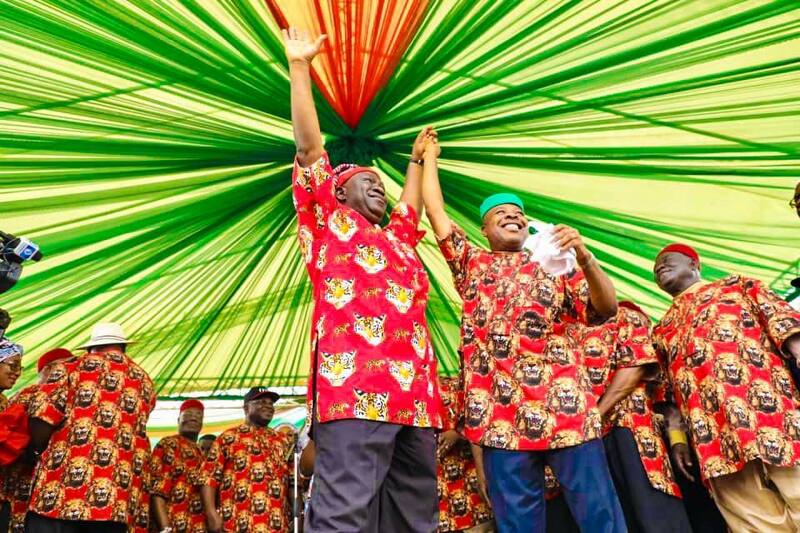 One Response to "Imo Governorship and the Arithmetic of Ihedioha’s victory." Well-said,but let me remind you the writer of this piece that the igbo adage”aki ilu a naghi ato dika o si wee daa n’onu”,is still a persistent reality:emeka ihedioha must as matter of fact wade off the onslaught being presented by the likes of chief humphery anumudu,chief martin agbaso,chief hilary eke,prince eze mmadumere,just to mention but a few of his fellow owerri based political technocrats before thinking of how presumably easy it would be to dilute as well as disjoint the orlu and okigwe political cohesion. Senator uzodimma remains the candidate to beat.